While some snake species can live long, problem-free lives in captivity and be docile pets, others make awful captives. Cobras, rattlesnakes and other venomous species are no-brainers, but even some snake species often kept by pet owners make terrible pets. Some have nasty dispositions, require food that is difficult to procure, or quickly grow far larger or need more space than the average hobbyist can cope with. Some of the worst snakes as pets present all of these difficulties. Several factors combine to make African rock pythons poor pets. These pythons can reach 20 feet or more in length. They require lots of the foods that are appropriate for such a large snake, such as chickens and rabbits. Their disposition can best be described as irritable, which can make keeping an African rock python as a pet an exceptionally scary proposition. African rock pythons in the international pet trade are either wild-caught or, at best, captive hatched animals, which introduces problems with disease and parasites. As the record holder for length among all snakes, the reticulated python is particularly ill-suited to captivity. While most captive specimens will be about 12 to 14 feet, the largest verified individual measured 32 feet 9 inches long. In their wild habitats in mainland Asia and the Philippines, they are feared for killing farm animals and their ability to kill humans. These snakes are most active at night. While this is not a snake that should be kept by hobbyists because of the danger, numerous breeders work with this species despite their great size, and offer several color and pattern varieties. Boa constrictors often have rather benign dispositions, but if a boa's attitude changes, she is capable of delivering a serious bite. Reaching up to 13 feet long, boa constrictors are native to the tropical forests of Central and South America. In captivity, boas must have a reasonable facsimile of their natural habitat, which a pet owner will find difficult to provide on a large scale. The Burmese python is one of the most commonly kept captive snakes, despite a mature length of at least 20 feet. These pythons reproduce readily and prolifically in captivity, depositing up to 100 eggs per clutch. The result of this mass production is that thousands of people who take on young Burmese pythons as pets end up with snakes that are too large, and they release them into the wild. In areas like Florida's Everglades, these huge snakes have established invasive breeding populations despite efforts to control them. The green anaconda presents many of the same problems in captivity as other large constrictors do: They are irritable, require huge amounts of food, and achieve enormous size. This is the heaviest snake species, with recorded weights of up to 485 pounds. Setting aside immense size, caring for an anaconda is very difficult and expensive. These snakes spend much of their time in the water, and require very large water tanks in their enclosure, which are difficult to maintain. Captive-bred ball pythons can be good pet snakes, but wild-caught ball pythons are horrific captives. Wild-caught individuals are often rife with pathogens and parasites, and are notoriously difficult to induce to eat in captivity. Although the species can be calm and docile, the stress caused by importation often makes the wild-caught individual defensive. All too often, wild-caught ball pythons are irritable and sick, lasting only a few miserable months before they succumb to disease or starvation. The idea of a pet flying snake may seem intriguing, but diet and habitat needs make them unsuitable for captivity. These snakes can’t technically fly, but they do have adaptations that let them spread their ribs, which provides lift and slows their descent to the ground. In their native Southeast Asia, these snakes will glide from tree to tree as they move through their territory. As these snakes are not only lizard eaters, but also mildly venomous, they definitely shouldn't be kept by hobbyists. Named for their viper-like appearance, which is complete with broad triangular head and stout body, viper boas live a lifestyle similar to many pit vipers.Though small size is a great trait for a captive snake, young viper boas are so small at birth that providing appropriate food is difficult. Viper boas live primarily on frogs and lizards in their Indonesian homeland, which is problematic for most keepers. Additionally, most specimens offered in the pet trade are wild-caught, which means they will be full of parasites. Mud snakes are found in the Southern United States, and though they have a number of traits that would make them good pets -- they are generally docile and don’t get too big -- they possess one serious drawback in captivity: They are extremely picky eaters. Wild mud snakes will eat only a few types of amphibians, and they will generally refuse food entirely in captivity. These snakes should not be considered as pets. Black racers are beautiful animals, but they are not suited to captivity. Most black racers offered for sale are wild-caught individuals. Generally speaking, black racers are defensive animals, meaning they react violently when handled. According to Brett Hodges of rightpet.com, black racers generally do not calm down and tolerate handling, even after long periods in captivity. 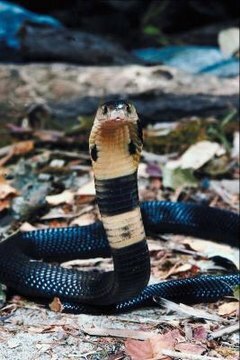 An additional problem with these snakes is their need for extremely large cages; black racers are widely wandering serpents that require up to 14 hectares (about 35 acres) of space in the wild.